The Atlanta Pride March will take place this Sunday. Atlanta Jobs with Justice will join a number of our member organizations including - UNITE HERE Local 23, the Metro Atlanta Democratic Socialists of America and Congregation Bet Haverim who will be marching in the parade. The rights of LGBTQ workers in the workplace are workers' rights. LGBTQ rights are human rights. Many of our sisters and brothers within the movement identify as LGBTQ, and its important that the Atlanta labor community stands up strong for the rights of all workers, including those who identify as Lesbian, Gay, Bi-sexual, Transgender and or Queer. More info about the march can be found HERE. *If anyone is interested, we will be making signs/banners at the UNITE HERE office a little bit earlier at 10:00 am on Sunday (Suite 514 at the IBEW Bldng). Folks are welcome ! Over 200 Atlanta community members stood with farm workers from Immokalee, FL on Thursday. Publix continues to sustain poverty in the fields by refusing to meet basic standards that 11 other corporations have already agreed to including: Pay 1 penny more per pound of tomatoes picked and respect basic health and safety protections on the job. 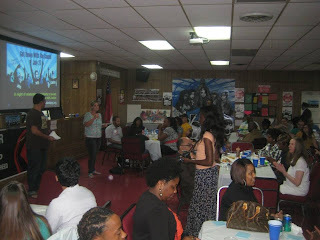 Thank you to all who supported us at our fundraiser! We raised over $3000! 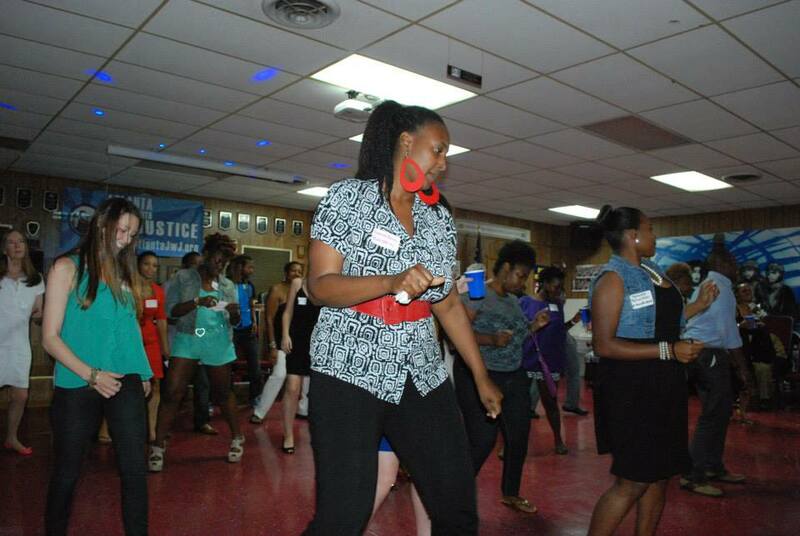 Big thanks to all those who came out to our Get Down With The Cause Fundraiser on Saturday night! We were able to raise over $3000 at the fundraiser! We appreciate all the donations and the support for our work! We couldn't have done it without you! An extra special thank you to CWA Local 3204 for hosting our event at their hall! At 5:30 am on Thursday 8/29/13 a crowd began to gather at the corner of Moreland Ave and Glenwood Ave. in Atlanta, GA. It was unclear leading up to the event how many would make it out before the sun rose... As the organized group swelled to 80+ it became clear that the first fast food strikes to hit the Southern US via Atlanta, GA had hit a nerve. With over 65,000 fast food workers in Atlanta making a median wage of $8.59/hour the level of engagement was no surprise. At about 6:00 am the crowd including striking fast food workers from Subway, Arby's, McDonald's, TJ's Sandwiches, Great Wraps and Church's Chicken marched to the McDonald's on Moreland Ave.
A strike line was set outside of the store, and striking workers shared why they were going on strike. Pictured to the left is Tina who works at Church's chicken and her daughter. "I'm here to stand up for the ones who might be afraid to stand up. I'm here to fight for 15$ and the right to form a union. I've been with the company for three years and with the money that I help make for Church's... I feel as if I need a little more money to provide for my daughter." The crowd gathered and entered the McDonald's in order to deliver a letter that included the demands to raise the wage to 15$. The letter was not targeted at the franchise owner, but the corporate headquarters of McDonalds. Fred has been working at this Church's Chicken location for 15 years and makes $8.25/hour. He works 35 hours per week but would like to work more hours. Fred led a letter delegation into the store to share their demands with the store manager. Following the letter delegation, Fred participated in a phone interview with the station 1310am, a Latino oriented community radio station in Georgia. He shared his story, which was then translated into Spanish. Fred's experience resonated with the listeners given that many Latinos in Georgia are facing similar starvation wages. Congressman John Lewis shared these humble, powerful and loving words with the fast food workers and their supporters. There is a moment at 1:45 in the video posted below where Congressman John Lewis hugged Pamela, a striking worker from Great Wraps. An embrace that perhaps captures more than words ever will, why we must raise the wage. 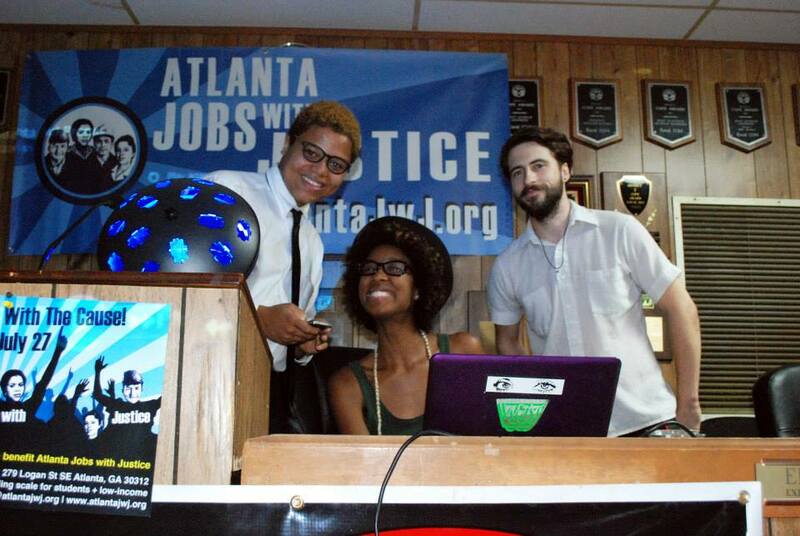 Below is a list of media coverage for the Atlanta Fast Food Worker Strikes. Fast Food Workers Mount Walkout Across The U.S.
August 29, 2013. NBC: 11Alive, Holly Pennebaker. August 30, 2013. Creative Loafing, Joeff Davis. August 29, 2013. CBS Atlanta, Mandi Milligan. August 29, 2013. ABC: WSB-TV, Steve Gehlbach. August 29, 2013. CBS WSPA, Spartanburg, SC. August 29, 2013. New Observer, Raleigh, NC. August 29, 2013. CNN Money, Alanna Petroff and James O'Toole (features video of Atlanta Great Wraps worker Pamela). August 29, 2013. Bill Moyers.com. Congressman John Lewis Standing with Striking Fast Food Workers! Join the Fight! 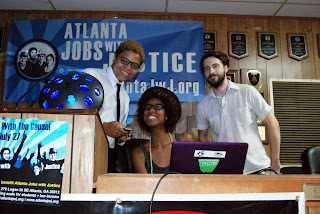 - Atlanta is joining the Fast Food Worker Movement! The fastest growing jobs in the United States are also the lowest paid. Fast food provides an increasing share of our new jobs, but workers are paid between $10,000 and $18,000/year less than half what it costs to support a family in the Atlanta Metropolitan area. Fast Food workers are not paid enough to afford basic needs like food, clothing, and rent. They often qualify for public assistance, which means that major profitable corporations are forcing taxpayers to subsidize their low wages and burdening the economy. The Fast Food Industry (McDonald's, Burger King, Chick-fil-A) is a booming industry which accounts for over $200 BILLION in profits. They should pay their hard working employees enough to cover the necessities and support their families. This is the main reason why fast food workers are joining together nationwide to demand a livable wage and protection from unlawful treatment. Do you or someone you know work at a fast food restaurant? Contact Jawair at (305) 205.9131 or at jawairculbreath@yahoo.com. 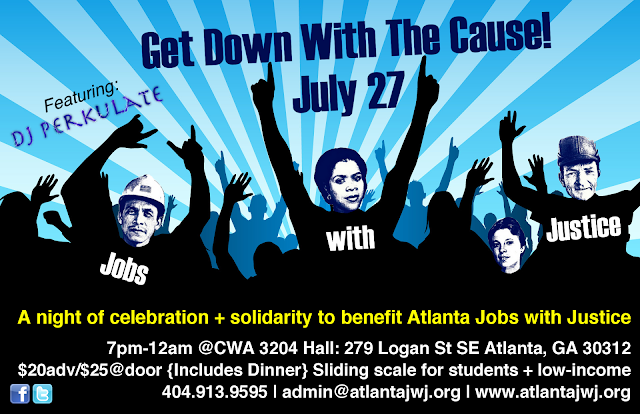 Join Atlanta Jobs with Justice and the Atlanta Workers Organizing Committee in an Action of Solidarity to show why supporting the working class matters. Where: Five Points Station: 30 Alabama St SW, Atlanta 30303 (Map/Direction). Who: We are inviting community members, labor leaders, political leaders, distinguished clergy members and all volunteers to attend this historic event. *We are targeting the central corporations (national or multi-national) of the fast food restaurants, not the local franchise owners. 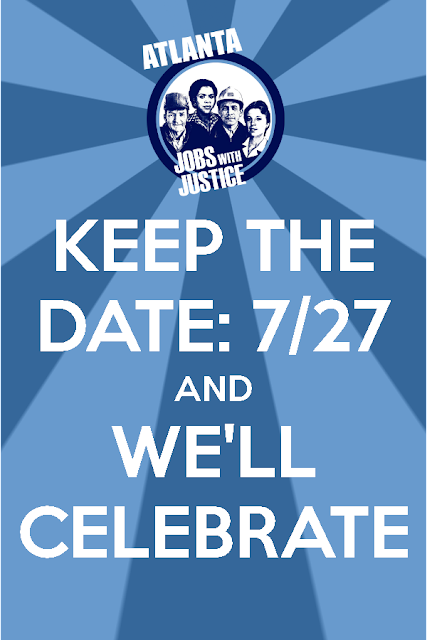 Come join us for a night of celebration and solidarity to benefit Atlanta Jobs with Justice. We will be lifting up the work and struggles of Atlanta Jobs with Justice coalition members and highlighting several victories we saw over the past year. Tickets are on sale online and in-person for $20 in advance and $25 at the door. Sliding scale for students, youth, and low income folks, kids 12 and under are free. 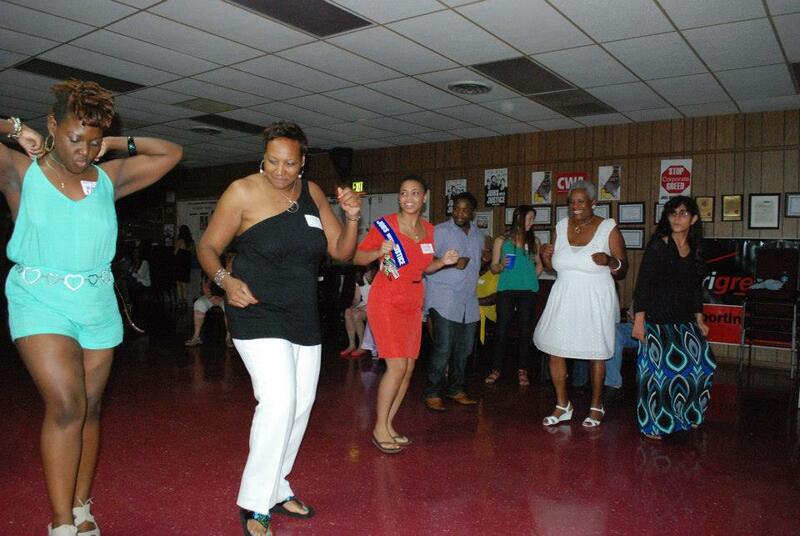 Included in the price will be dinner catered by a local authentic Mexican restaurant and music and dancing. Beverages will also be available for purchase. Atlanta's very own DJ Perkulate will be spinning tunes all night. So come join us and bring a friend so we can light up the dance floor and get down with the cause! Workers and Students at Emory Celebrating Victory. Photos from the March to Defend Unemployment Benefits ! Spelman Student Ayanna Spencer Speaking Out in support of campus workers! Agnes Scott Students and Workers Marching. Lisa Lewis with AFSCME 1644, Sodexo food service for Atlanta Public Schools Speaking out. The GA Labor Commissioner was forced to shift his stance around unemployment benefits to GA school workers to the tune of 8 million dollars in back pay to 4,000 GA school workers. This is huge! However, it is more critical than ever that we come together this Saturday to turn up the heat and hold the GA Department of Labor (DoL) accountable. 1) It remains unclear where the 4,000 number emerged from. We believe this number is low and that more GA school workers should be receiving wrongfully denied unemployment benefits. Some school workers stopped applying for the benefits because they knew the GA Department of Labor was not dispersing benefits. School workers should not be penalized for following information sent by the GA DoL ! 2) The mechanics of the disbursement remain unclear. We are hearing mixed results from school workers regarding their back payments **To GA School Workers, please reply to this e-mail or call our office at 404-913-9595 if you have received any communication from the GA DoL. It is important that we monitor the situation closely. 3) GA Labor Commissioner Mark Butler has already stated he will push legislation next year to deny school workers their unemployment benefits. We must continue organizing for full and fair employment now. 4) It is through organization that we beat back an attack on working Georgians by a statewide politician... It will be through organization that we continue to push for respect for all GA school workers. We must come together to discuss union organizing and student organizing strategies moving forward. 5) Although it is implied that GA school workers will be able to receive unemployment benefits when laid off this upcoming summer, we want a written and clear confirmation from the GA DoL that this is the case. All that being said.... The time to unite with GA school workers and students from across the state is this Saturday April 20th at 12:00 pm.We will gather at the Atlanta University Center (AUC) right in-front of Clark Atlanta University on the Promenade, 223 James P. Brawley Dr. SW Atlanta, GA. There is a visitor parking deck one block east at the corner of Mildred St. and Atlanta Student Movement Blvd. We will march 1.6 miles to the US DoL offices on Forsyth St. in Atlanta. For folks that cannot march that far we will have transportation from the AUC to the US DoL Office. Following the march there will be a gathering of GA school workers and students on Spelman's campus to talk out next steps. There will be a membership drive for Atlanta Jobs with Justice with a reduced cost of $5.00 to become a dues paying member during the march. Take advantage of this opportunity to get further plugged into the movement for working people in GA. Please spread the word! Especially to impacted GA school workers... If there are any questions please call the Atlanta Jobs with Justice office at 404-913-9595. Justice for School Workers ! Will fight this bill to the end. And then we march. Justice for School Workers. Despite passionate arguments by the GA senators that stand with working people, HB361 passed the senate on a party line vote (36-16) on Monday. It now goes back to the house for an up or down vote, and if voted through it will go to Governor Nathan Deal to be signed or vetoed. 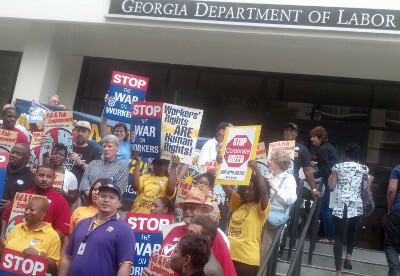 We will fight this bill to the end and then we will March to Defend Unemployment Benefits in GA on April 20th. Tomorrow (Thursday) is the last day of the legislature (called "sine die") and HB361 needs an up or down vote in the house. Take action below to urge speaker of the house David Ralston, your congressperson, and Governor Nathan Deal to stop it. HB361 would put into state law Georgia Labor Commissioner Mark Butler's unemployment benefit cuts to laid off Georgia school workers. HB361 would also undermine workers' ability to sustain union representation in their workplace. Stand with Georgia cafeteria workers, bus drivers, crossing guards and private school teachers! 1) Click Here to take action online and send a message to your representative, the Speaker of the House David Ralston and Governor Nathan Deal opposing HB 361. 2) Call your GA House Rep. and David Ralston the Speaker of the House and tell them to oppose this bill. I am calling because I am opposed to HB 361, a bill that would eliminate unemployment benefits for over 60,000 school workers in GA. This bill is not fair because these workers are laid off multiples times a year during school breaks oftentimes with no income. They do not have the same job security and benefits as public educational workers. HB 361 is bad for GA school workers and bad for GA's students. This afternoon, the GA State Senate will vote on HB 361, a bill that will effectively ban over 60,000 school workers in the State of GA from receiving unemployment benefits when laid off during school breaks. This bill comes a year after GA Labor Commissioner Mark Butler unilaterally denied unemployment benefits to GA school workers with out any authorization under the law. This bill is an effort to bring Mark Butler's extralegal decision into accordance with unemployment law. The push for this bill highlights the unlawful nature of the unemployment benefits that were already denied to GA school workers throughout 2012. Earlier this month the senate tried to pass this measure as an independent bill SB 227, however that bill failed to crossover. The language of SB 227 was amended to HB 361, a bill designed to allow let union members leave their union at any time during the year, and require the posting of instructions on how to leave or decertify unions in the workplace. Today, GA Senators will decide whether low-income school workers across the state will permanently loose access to the unemployment benefits in which they require to support their families. The Georgia anti-working family legislators are at it again. After SB227 (the bill that would put Labor Commissioner Mark Butler's denial of unemployment benefits into law) failed to pass a Senate Committee, legislators are still trying to pass this bill by attaching it to HB361. HB361 would now legalize Mark Butler's unlawful denial of unemployment benefits to GA school workers and undermine workers' ability to sustain union representation in their workplace, an all out assault on the rights of Georgia workers. 1) Click Here to take action online and send a message to the GA Senate opposing HB 361. 2) Call your GA State Senator and Lt. Gov Casey Cagle the President of the Senate and tell them to oppose this bill. I am calling because I am opposed to HB 361, a bill that would eliminate unemployment benefits for over 60,000 school workers in GA. This bill is not fair because these workers are laid off multiples times a year during school breaks and most have no income during these periods. They do not have the same job security and benefits as public educational workers. HB 361 is bad for GA school workers and bad for GA's students.